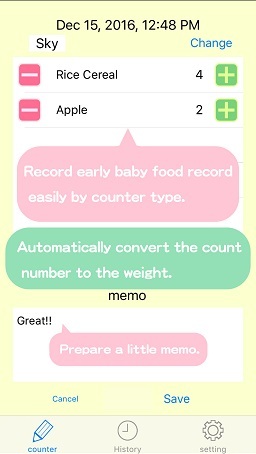 "Baby food counter" is a recording application for the early stage of baby food. The recording method of this application is counter style. You can record while raising the baby. Because counters are provided for each side dish, you can record several side dishes at the same time. By setting the weight per mouth, the count number is automatically converted to the weight. You can record the state of meals at the memo function. * Weight per mouth can be set for each side dish. 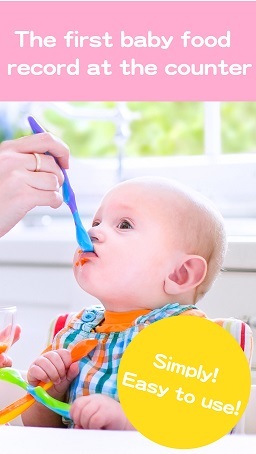 * Since it can be set with different weights even with the same side dish, it can be registered for each spoon. 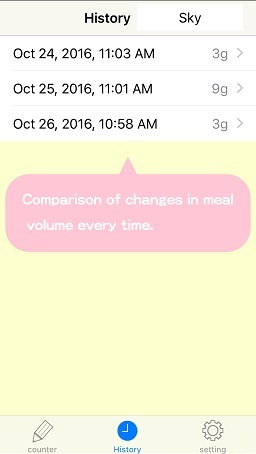 In the list after recording you can check the change in the amount of meals each time at a glance. You can also check details, you can check the amount of each side dish and the time spent on meals. You can register some babies. In the history, the list is displayed separately in the baby.